We hope you had a Happy Thanksgiving! The holidays, especially Thanksgiving, are the perfect time to think of all the people, moments, and memories that make us feel most grateful. From our team’s perspective, one of the aspects we love most about our job is being able to delight our clients with surprises and playing a role in joyful moments that we hope they will treasure. We had the fortune of sharing one of life’s joys right before Thanksgiving by installing a darling travel themed nursery for a baby boy due in January. 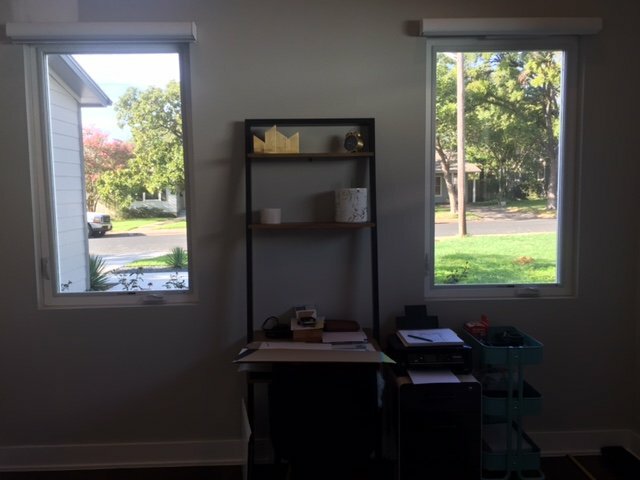 Our client, a very excited first time mother, wanted her son’s nursery to be complete before the holidays and with plenty of time before her due date. We were nervous that her pieces wouldn’t meet her dream deadline before Thanksgiving, but with some due diligence and persistence everything made it in just in time! The spare bedroom was basically an overflow room for storage. It was a clean space to transform into a nursery. Such a darling space! The travel theme is mainly brought in with the accents that include fabrics, wall prints, and decor. The accents are subtle enough so that the nursery can grow and transition with the little traveler through the years. A more fixed attraction to the space is an accent wall with navy grasscloth paper. It gives the room a focal point, while also providing texture and interest to the space. Above the crib and on top of the wallpaper accent wall, we framed 3 travel prints in sleek, modern acrylic frames. 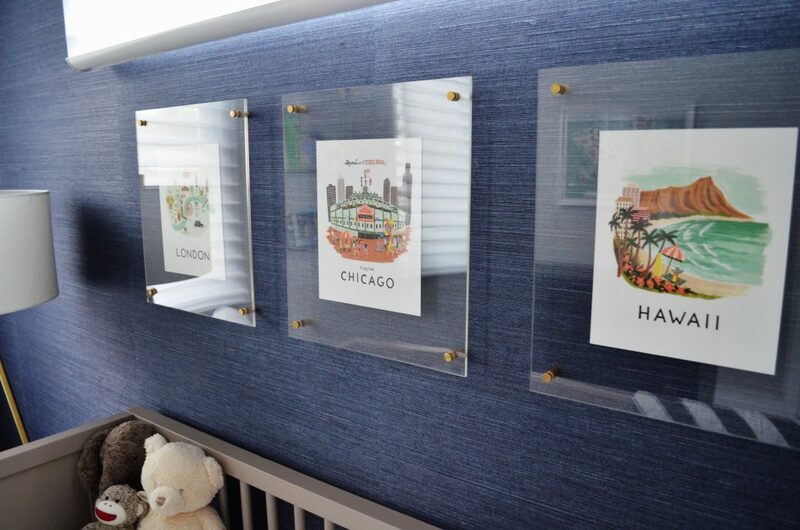 The artwork can be changed when necessary, but for now the prints are representative of the new parents favorite cities. 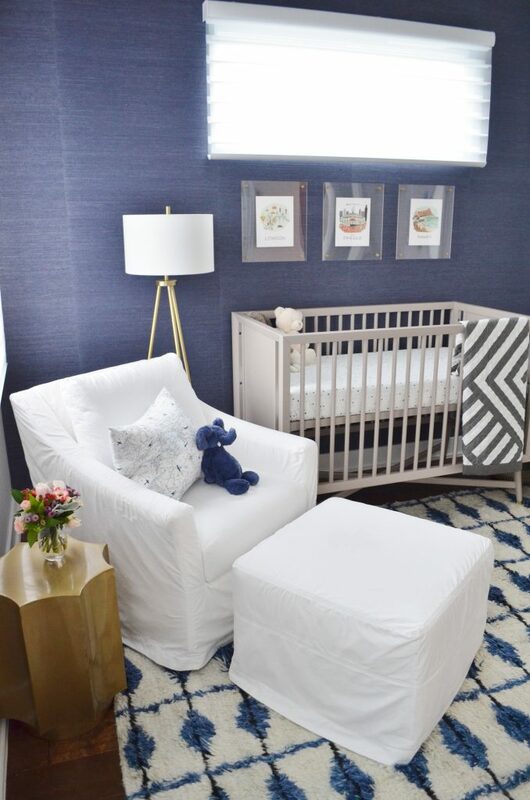 Next to the taupe-gray crib, we placed a glider chair, ottoman, and brass floor lamp. It is a cozy space for mom and dad to rock the baby to sleep, and hopefully a place they can sneak in some rest themselves every now and then. The chair and ottoman will be treated with Fiberseal, a fabric protectant, to make it more baby and nursery friendly. 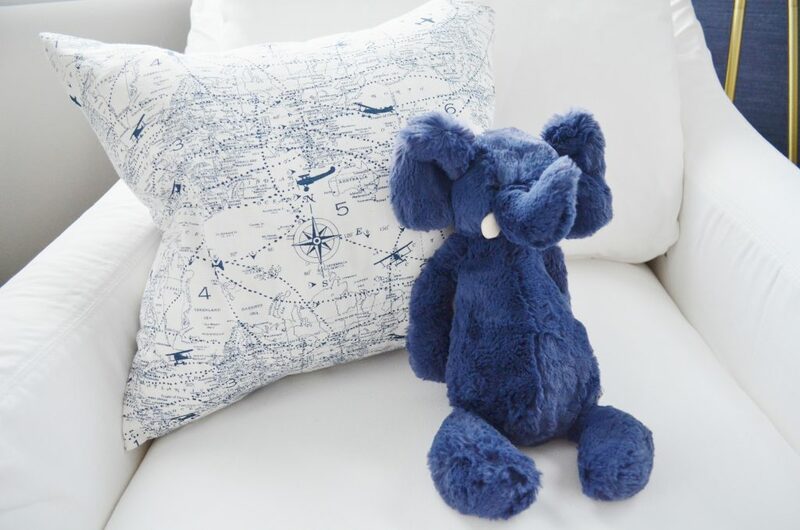 On the chair we selected a cute map print pillow to coordinate with our navy and white color scheme. It is adorable next to the navy blue elephant! 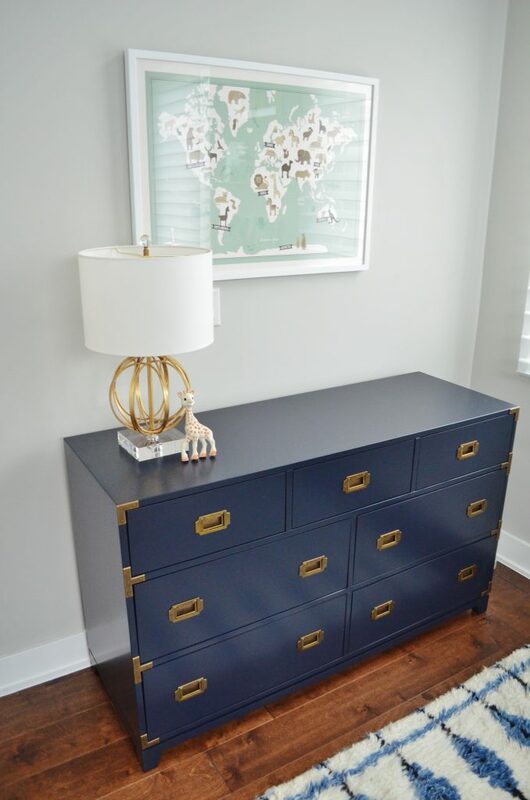 Across from the crib and cozy corner, we placed a large navy and brass dresser. The dresser will store away all the baby essentials and also serve as the designated changing station. The world map above the chest gives another detailed nod to the travel theme. 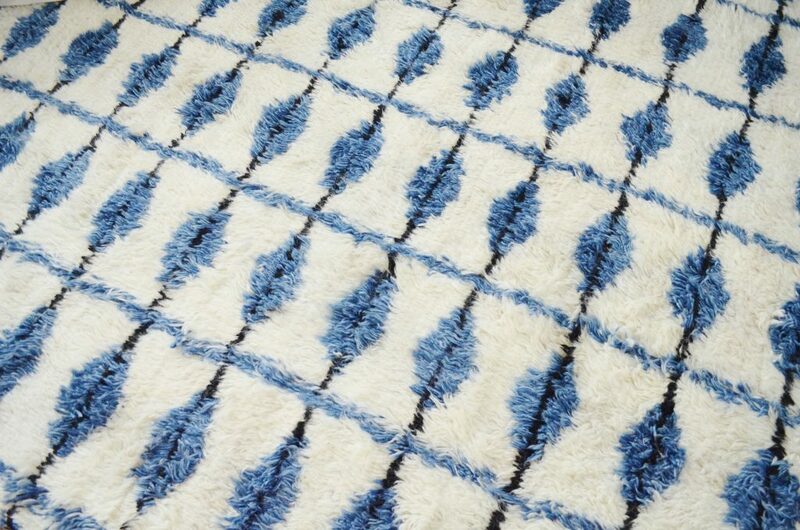 Other accents we brought in include a plush and soft rug, perfect for the nursery floor. 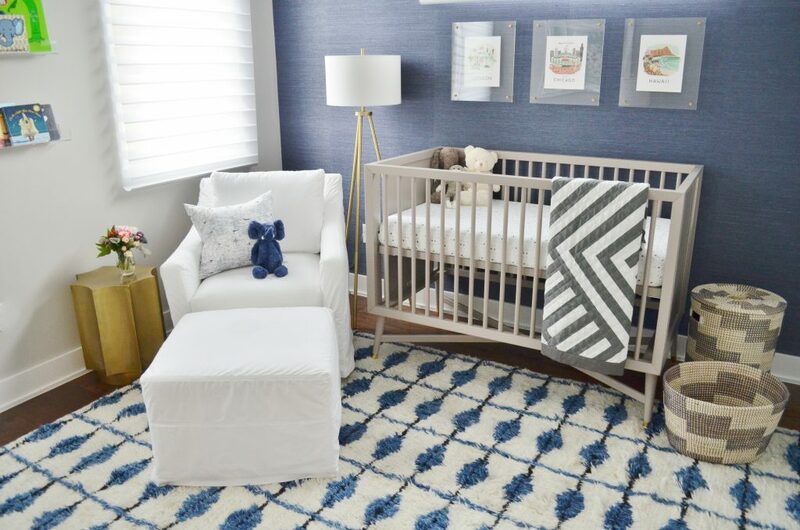 It ties the color scheme together, grounds the space, and gives the travel nursery even more style and playfulness. The rug will be an appropriate place for the baby boy to crawl and eventually walk. It is certainly ‘explorer’ friendly. 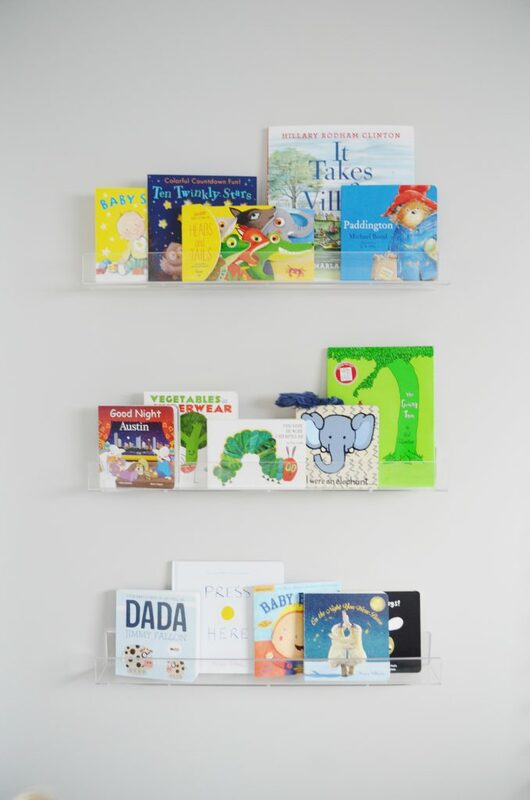 On an adjacent wall, we installed a set of acrylic shelves as a clean and sleek option for book storage. This is a great solution if you want an alternative to wall art or if you just don’t have the proper space for display and storage. The books can be swapped out with time with more age appropriate options. 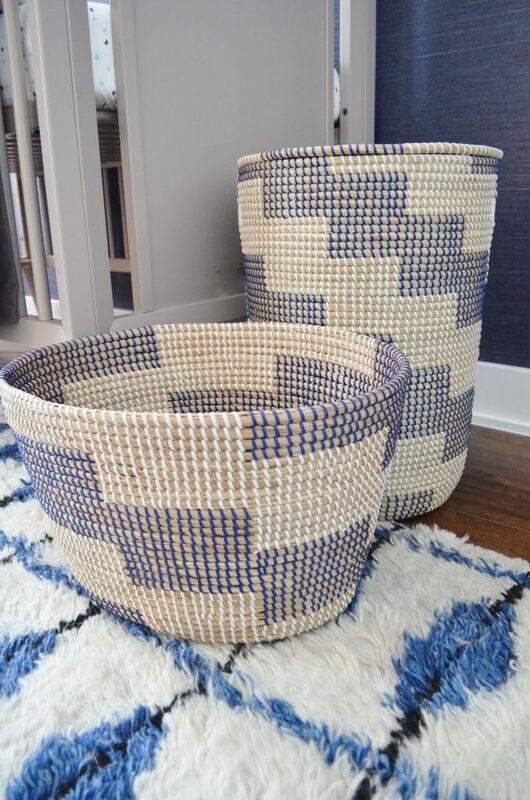 Last but not least, we brought in a stylish hamper and basket with a graphic print to sit right next to the crib. Details like this give the room character and make it feel even more cohesive. This travel nursery was such a treat to work on and install. But the best part, is seeing the excitement and joy beam from the mom-to-be after our install reveal. It was a special moment that is so priceless. It continues to makes us feel so grateful. If you are ready to let our team bring you a joyful design moment, please fill out our questionnaire! What’s New Wednesday: Moving Sale Starts Friday!